Now that I have been using the TextEditor for some time I’ve noticed that I mostly keep editing just one or two files. Always opening the file browser and selecting the file has started to feel a bit cumbersome. So adding a recent files page to the TextEditor seemed like a good idea. The application could keep track of the most recent files and then display the list of files in one page for quick access. The figure below shows the user interface. The main editor page shown on the left hand side has the recent files button in the toolbar (in the middle). When the recent files button is clicked a new page is opened (shown on the right hand side) that displays the most recent files (+ folder names). Clicking on the file name will open the file. Clicking the back button in the recent files page toolbar will go back to the editor page. 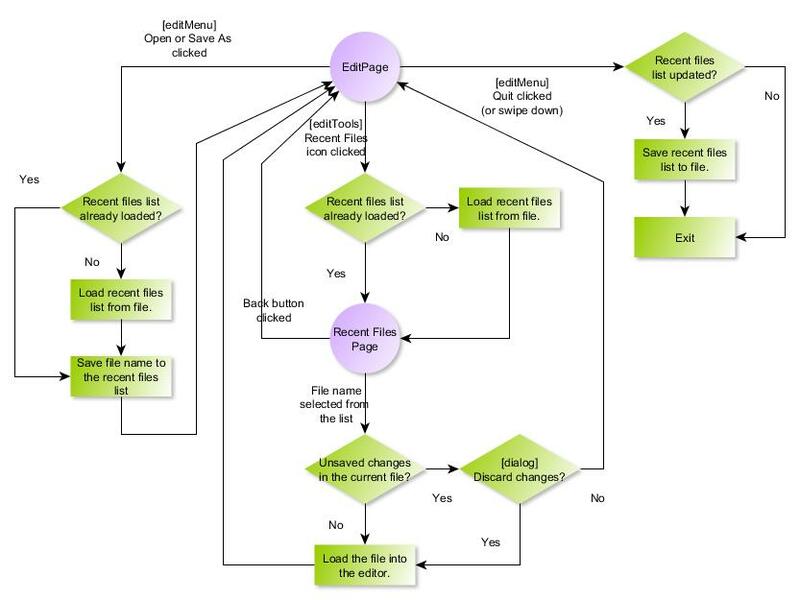 The flow diagram below shows how the recent files page is linked to the main editor page. The recent files list is kept in a file that is loaded when it is needed for the first time: either when the user clicks the recent files button in the EditPage toolbar (the list needs to be displayed) or when a file is opened or when a file a saved with a new name (the list needs to be updated). When the application is closed we need to save the recent files list to a file (if the list has been modified). 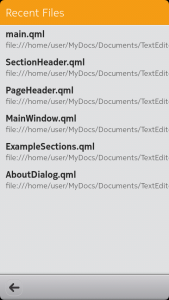 The recent files page is defined in the file RecentPage.qml. 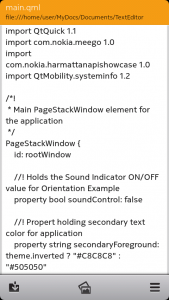 The QML page is actually quite easy to construct by using the ListView component found in the com.nokia.extras library (for more information please see the ListView help page). We will define one signal ‘recentCancelled’ that will be emitted if the ‘Back’ button is clicked in the toolbar. The signal handler onRecentCancelled will just pop the RecentPage from the page stack so that we will return to the EditPage. The file RecentTools.qml defines the toolbar and the file Header.qml defines the page header. For the ListView component we just need to provide the model (a list of file and folder names). The model will be implemented in the C++ side. For the delegate we can use the ListDelegate component (also available in the com.nokia.extras library, please see ListDelegate). ListDelegate requires that the model provides two roles: title and subtitle for displaying the model data. The onClicked signal handler in the delegate will fetch the file name (title) and the folder name (subtitle) from the model. These will be then passed to the C++ side to perform the file I/O operations. The signal ‘recentFileClicked’ is declared in the main.qml file and connected to the corresponding slot in the TextEditor class (texteditor.cpp). The RecentTools.qml file defines the toolbar contents. There is only one button (“Back”) to define in this case. readRecentFiles: to read the recent files list from file. store: to store the data read from file to an internal variable (stringList). addFile: to add a file specification to the recent files list. removeFile: to remove a file from the recent files list. The variable stringList will hold the file names. Each list element is formed with the folder name and the file name separated by the vertical bar character: <folder name>|<file name>. We can then use the QString split method to extract the parts, e.g. to get the folder name from list index k we can say stringList.at(k).split(“|”). There is one signal: openFailed. It will be emitted if we cannot open the file containing the recent files list. There is also one slot: closing. It will be connected to the aboutToQuit signal (emitted when the application is closing) to save the recent files list before exit. // rowCount() and data() functions. // 2) Save As succeeded 3) Open succeeded. The recentfiles.cpp contains the class constructor and implements the mandatory functions and the helper functions. The class constructor defines the model roles in the QHash roles variable. The role names must be “subtitle” and “title” as those are the names that the ListDelegate QML element is expecting. I will use the subtitle role to display the folder name and the title role to display the file name. The constructor will also connect the openFailed signal to the corresponding openFailed signal defined in the QML side (in main.qml). The rowCount function will just return the recent files list size. The data function will return either the folder name or the file name depending on the role input parameter. If the index or the role is invalid it will return an empty QVariant. // to role names "subtitle" and "title". // already tried to load the file names? // file is already in the beginning of the list? // file is elsewhere in the list? // not in the list? // Did we modify the recent files list? I will instantiate the RecentFiles class in the main function and then put it into the root context. That will make it available to the QML components. Note how the aboutToQuit signal is connected to the RecentFiles class closing slot. The aboutToQuit signal is emitted when the application is closing (either after selecting Quit from the TextEditor file menu or by swiping down). This allows us to save the recent files list before the application is closed. // setting of the device is not available. // Create the back-end processor and pass in the root object and the recent files model. As the final step we need to update the toolbar in the EditPage. The toolbar is defined in the file EditTools.qml. One new ToolIcon element needs to be added to the ToolBarLayout. We will emit the signal toolRecentClicked (defined in main.qml) when the button is clicked. The signal is connected to a slot with the same name in the TextEditor class. The toolRecentClicked slot will try to load the recent files list from file and then emit the signal recentRequested that will be connected back to the QML signal recentRequested. The signal handler onRecentRequested will push the RecentPage.qml file into the page stack to finally display the recent files page. // TextEditor requested RecentPage to be opened for selecting a file. The updated version v1.4 is available in OpenRepos and can be easily installed with the N9 Warehouse application. The source code is available in github. You can open the project in Qt Creator IDE by selecting File>New File or Project…>Project from Version Control>Git Repository Clone. 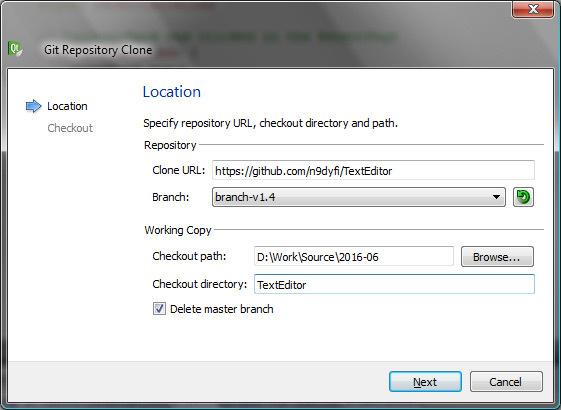 The repository can be found from https://github.com/n9dyfi/TextEditor. The current version (v1.4) is available in branch-v1.4.